What happens when life begins to trip us up and failure starts creeping in? Many of us just keep on doing the same thing, hoping for different results. Some of us look for escape, to find a way out of the mess we feel that we’ve created. But neither enduring nor escaping is ultimately what we need. The answer is to allow ourselves to begin again, every day, in every part of our lives. 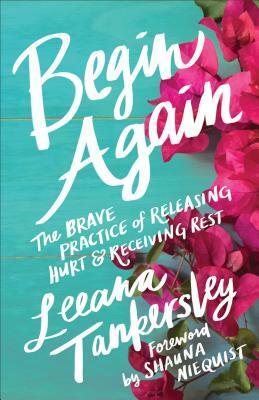 Through engaging, lyrical prose, Leeana Tankersley shows women how to forgive themselves, develop new and healthier patterns of living, and do away with resentment and regret. Her life-giving words will free women who are feeling stuck and allow them to clear out the debris to make room for what God wants to do in their lives. To begin again is to open the window, even a crack, to let the breeze of grace come in. It is a call to stop running from our fears. To take one small step toward becoming the brave women we were made to be. I enjoyed the message of this book, but the execution was extremely lacking. Again, the message is great. Give your life over to Jesus, He will save you, and help you to start over when times are hard and you’re confused with life. I COMPLETELY agree. I’ve been dealing with some hard stuff and big decisions in the last year, and my newfound relationship with Christ has helped me in countless ways. I love being part of a church and reading my Bible; it’s been awesome, so I was really excited about this book because it seemed like I would be able to connect with it. The writing style was just so unpolished that it took away from the purpose of the book for me. This read like a first draft written by a middle schooler. No offense to middle schoolers… a 40 year old woman with an English degree should definitely be able to write better than this. The chapters were so short and choppy. The sentences were so simple that it made it difficult to read. Come on. You. Do. Not. Need. To. Put. Periods. After. Every. Three. Words. Get it together, honestly. I am a word nerd. I LOVE sentence structure. Semi-colons are my favorite form of punctuation. The fact that I have a favorite form of punctuation should speak to the fact that I like books and reading. It just doesn’t make sense to me why you would write something so simplistic for the fact of emphasis. Complex sentences make the world-go-round, people! Another thing that was confusing to me: Unnecessary Capitalization. Um. It makes no sense to me why the word ‘love’ was capitalized… for no reason. It wasn’t representative of anything. It was just the classic meaning of the word. Why does it need emphasis then? There were so many instances of this and it just makes no sense. The way the stories and chapters were written was so confusing. She would start one story, then randomly jump to another thing, return but be going in a different direction. Bro. Chill out. Introduce the members of your family so I know what your kids’ names are. I don’t want to be confused the heck out about who Elle is in the second to last chapter! The thing with memoirs is that you need to be open about your life in order for them to be successful. I feel like I don’t know this woman because she didn’t explain ANYTHING about herself. Maybe I’m just in a hypercritical mindset right now, but these are my thoughts. I would still give this a try if you enjoy Christian self-help books; go in with an open mind.